Non-coding RNA (ncRNA) is involved in the regulation of almost all cellular processes, for example, by silencing genes or transcripts, binding proteins or by performing catalytic processes. While studying ncRNAs is expected to deepen our understanding of cellular processes, ncRNAs may even serve as drug targets (e.g. Howe et al. 2015). Our specific aim in the context of ncRNAs is to understand structure-function relations, which can deliever valuable insight for drug design. Applicationwise we are interested in the processes of genome packing in RNA viruses. 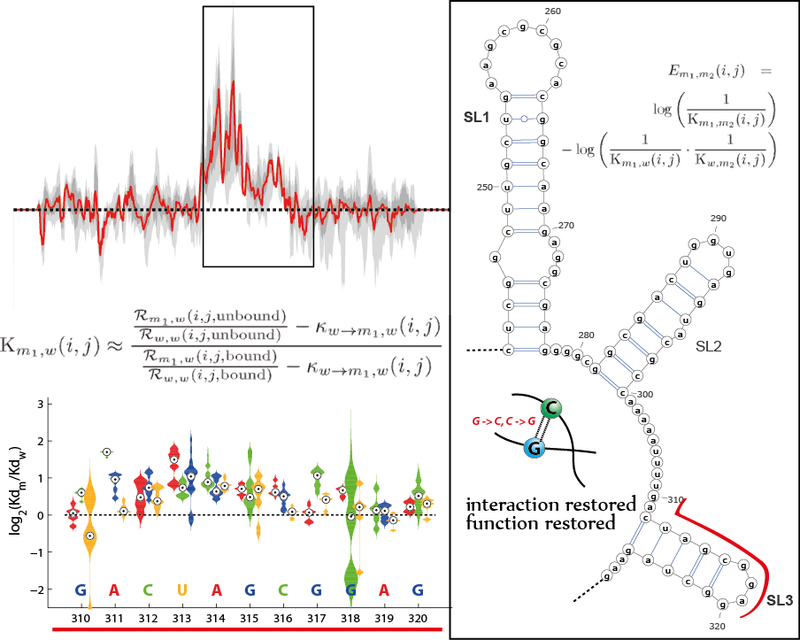 In order to study ncRNA function and functional structure in greater depth, we recently developed the Mutational Inference Mapping Experiment (MIME, Smyth et al. (2015)) together with partners at the University Strasbourg. MIME allows to investigate the interaction of RNA with its respective interaction partners in detail. The method utilizes an ‘evolutionary approach’: the target RNA is randomly mutated, yielding a pool of billions of randomly mutated RNA. An interaction partner, e.g. an RNA-binding protein, is added to this pool exerting a selection pressure with respect to the interaction. The resulting pools of RNA, separated according to functionality (e.g. protein-binding vs. non-binding) are sequenced with next generation technologies. This way the frequencies of all mutations at any position of the RNA are obtained. Through mathematical and statistical methods developed by the Systems Pharmacology & Disease Control group, the biophysical consequence (e.g. binding affinities) of every possible mutation can be quantified . This way, it is possible to determine which part and structural configuration of the RNA is responsible for the investigated function. A user-friendly software for the analysis of MIME data (the MIME Analysis Tool, MIMEAnTo, Smith et al. 2016) has recently been developed and is available for all common operating systems (Linux, Windows, Mac).